Add olive oil to saute pan and put over medium heat. Add onions and cook until translucent - about 4 minutes. Add garlic and saute another minute. Add beet tops and vinegar and stir until green are wilted slightly. Tranfer quickly to serving dish and add salt and pepper. Toss again and serve immediately. In a small bowl, mix together olive oil, balsamic vinegar, mustard and honey. Whisk until blended. Pour over beet greens and toss well to coat. Add olive oil to a large pot and put over medium-high heat. Add beet greens and cover. Cook for 1-2 minutes until greens are wilted. Drain spinach and transfer to a large plate lined with several layers of paper towels. Let cool for a few minutes and then squeeze out as much liquid from greens as possible. Melt butter in large skillet over medium heat. Add garlic and stir and cook for 1 minute. Add in cream, salt, black pepper, cayenne pepper, nutmeg, paprika and lemon juice. Stir often and cook to reduce cream sauce by almost half, about 6-8 minutes. Remove from heat and add beet greens to skillet. Stir spinach into cream sauce for about 2 minutes, until well coated and heated through. Stir in cheese and serve immediately. 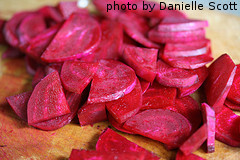 Place beets in a large stockpot and add water until beets are barely covered. Bring to boil and cook 8-10 minutes, until almost tender but still somewhat firm. Drain beets and reserve 1 cup of the beet water. Let beets cool and then peel by rubbing them with your hands. Sterilize 5 pint jars and lids by boiling them. Fill each jar with beets, leaving 1 inch of space up top. In a large saucepan, add beet water, sugar, salt and vinegar. Bring to a boil and stir so that everything is dissolved. Pour the hot liquid over the beets in the jars and seal the lids with rings. Place jars in a waterbath canner and process for 10 minutes in boiling water. Remove jars from canner and let cool. Check to see that all lids have sealed and store in pantry or root cellar. If any lids did not seal, you can process them again or just store them in the refrigerator. Peel carrots and beets and wash red potatoes. Cut carrots, beets and potatoes into bite-sized pieces that are all roughly the same size. Add to a bowl and drizzle olive oil over the top. Toss well and pile onto a baking sheet that's been lightly greased or sprayed with non-stick spray. Spread out vegetable mixture into a single layer on the baking sheet. Sprinkle salt and pepper over the vegetables. Roast uncovered in oven for approximately 30 minutes or until vegetables are tender. Serve immediately. Place beets in a large saucepan and add water until covered. Bring to a boil and reduce heat and simmer for about 10 minutes, until beets are tender. Drain beets in a strainer, reserving 1/4 cup of the cooking liquid. In the same saucepan, whisk together brown sugar, balsamic vinegar, beet water, cornstarch, cinnamon and cayenne pepper. Add the beets and butter and cook over medium heat, stirring constantly. Cook for 2 minutes until sauce thickens slightly. Serve immediately.